New Buffalo Bills defensive coordinator Leslie Frazier was quoted as saying “he couldn’t be happier” with the work DT Marcell Dareus has done this offseason. Frazier added that Dareus can be “one of the most dominant interior defensive lineman” provided he stays healthy and out of trouble. Dareus was limited to a career low 417 snaps in eight games last season due to injury and a suspension at the beginning of the year. His PFF overall grade of 80.8 was his lowest since 2012 and the second lowest in his career. Despite the lack of production last season, his overall grade ranked 23rd while his run defense grade of 82.4 ranked 10th. 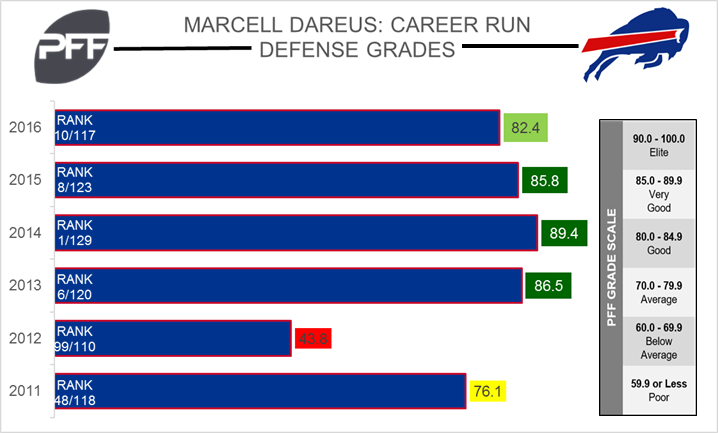 That marked the fourth straight year Dareus ranked inside the top 10 for run defense grade. Dareus also ranked 12th out of 75 qualifying interior defenders with a run stop percentage of 9.8. Dareus’ best season came two years ago in 2014 when he ranked ninth among interior defenders with a PFF overall grade of 87.3 and led the league with an 89.4 run defense grade. Furthermore his run stop percentage of 10.6 ranked fourth out of 82 qualifying players that season.